Every now and again a new makeup brand launch that really make me sit up and take note. Freedom Makeup London are one such brand. We’ve all heard of Makeup Revolution who dominated the affordable beauty market last year; you can check out some of my reviews here, here and here. Well now Mr Makeup himself, the creator of Makeup Revolution, Adam Minto has launched a new collection called Freedom. When they launched last month, I couldn’t wait to get my hands on some of their goodies. Having used Makeup Revolution products in the past, I was expecting great things from Freedom Makeup London and that is exactly what I got. Boy does that Mr Minto know his stuff! Freedom is all about creating professional quality makeup at an affordable price so that it is accessible to everyone. There’ll always be some makeup brands that are more expensive than others but that shouldn’t mean that only those with a high disposable income can afford to buy good quality and variety and I applaud Freedom for recognising this. There’s pretty much every makeup item you could think of available from Freedom, in lots of different formulas and colours from creamy pressed powder eyeshadows to pro precision eyeliner and palettes that are so packed with pigment you’d think you’d bought them from a Selfridges beauty counter. Not only is the selection of products amazing but they combine them in some great palettes too making the products easy to travel with and transport whether you’re heading to a makeup job or getting ready at your friends house before a night out! Freedom makeup is all about high quality, well performing products that are created with the latest style trends in mind. Whatever fashion you’re wearing this season, you’ll be able to find an eyeshadow, blush or lippy to really compliment your outfit and tie it all together. I’m sure you’re all wondering where you can find all of these goodies… Well, right on one of my favourite new beauty websites of course. The one and only Beauty Crowd. It goes without saying that this site is all kinds of wonderful. When I reviewed some hypoallergenic makeup products from Bell Cosmetics last month, I spoke more about the Beauty Crowd website then, you can read the post here if you like. Since then, I’ve been scouring the website weekly to keep abreast of the latest additions to their portfolio and any Beauty Crowd news that they may have. I’m always interested to see how a new company develops and I really feel as though Beauty Crowd have hit the ground running with their site. They’re all about listening to feedback and keeping ahead of the game so that they’re stocking products that we all want to buy. It makes perfect sense really but they’re doing it SO well. Have a look at their website the next time you’re scrolling around online. I will warn you though, it is a bit of a time vortex; it is very easy to lose hours and hours browsing their makeup and skincare pages, especially of products that aren’t as readily available here in the UK, and making wishlist after wishlist of beautiful pieces that you’ve got your eye on. Still, its only 5 months until Christmas…hello Santa! Never one to restrain myself, I picked out four different items from Freedom to try out from the Beauty Crowd website. They have their own brand page on there so it is super easy to find everything right in the one place. I will be reviewing each product over the coming days having tried them out over the last few weeks. If you’ve seen any pictures of me on social media recently, then these will definitely be some of the products that I had on my face. I was going to pop them all into one big post but as I started writing it, I had so much to say that I thought it would be easier to write four individual posts. Hey, its better to have too much to say than not enough isn’t it? The product I was instantly drawn to at first was the Freedom Bronzed Professional which is a pressed powder in a huge compact. 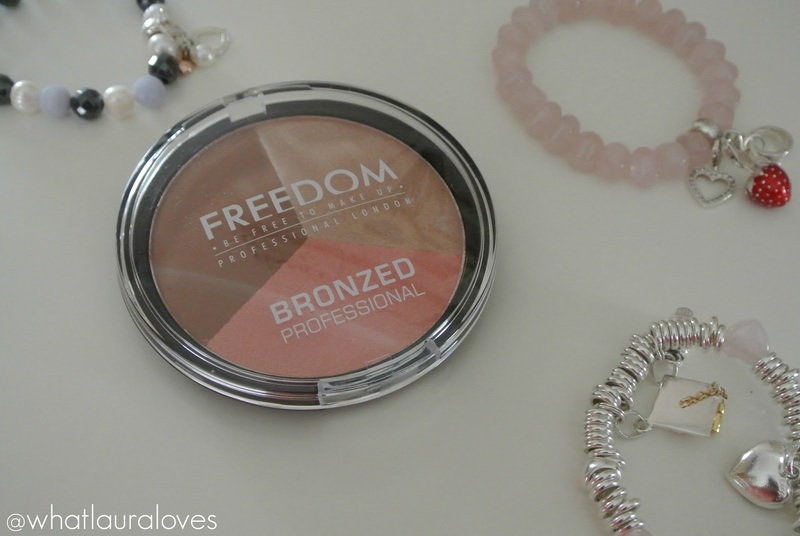 The Freedom Bronzed Professional is a bronzing powder with a difference. There’s three different ones available not only in different shades but in different styles too. First of all, there’s Bronzed Bronze which is a matte bronzer that is idea for contouring or for adding warmth all over the face. This one is a solid colour that is the only shade in the palette. Then there’s Warm Lights which comes in the same sized pan as Bronzed Bronze except this one is divided into three shades to suit different skin tones, all of which have a matte finish. This pressed powder trio is designed to bring warmth to the complexion and the different shades can either be used individually on different areas of the face, for example to contour, set concealer and highlight or swirled together to be used all over the face or on specific areas. Lastly, there’s Shimmer Lights which is the shade that I picked out as it looked as though it would be the perfect contour, highlight and blush palette. I’m sure you’ll agree, it is all kinds of pretty! Shimmer Lights is divided into three different shades; a matte bronzer that is perfect for contouring, a shimmery champagne highlight and a coral blush with some gold shimmer running through it. The combination of these colours together is absolutely stunning and they create the most gorgeous makeup look. Looking at them in the pan, they’re not too dissimilar to the shades in the Sleek Face Form in Light which is their contour kit that I reviewed in this post. Except I would say that the blush shade is a little lighter in colour in the Freedom Bronzed Professional powder than the Sleek kit. I’m not a massive fan of the blush colour in the Sleek kit and much prefer the one in this kit as it is a lot more wearable and the shimmer, while still very apparent, as more of a subtle effect on the skin than the Sleek blusher. The bronzer is completely matte making it ideal for contouring. It is quite warm toned but it does have enough of a cool tone in it to stop it from looking orange and to create just the right amount of shadow on the face. 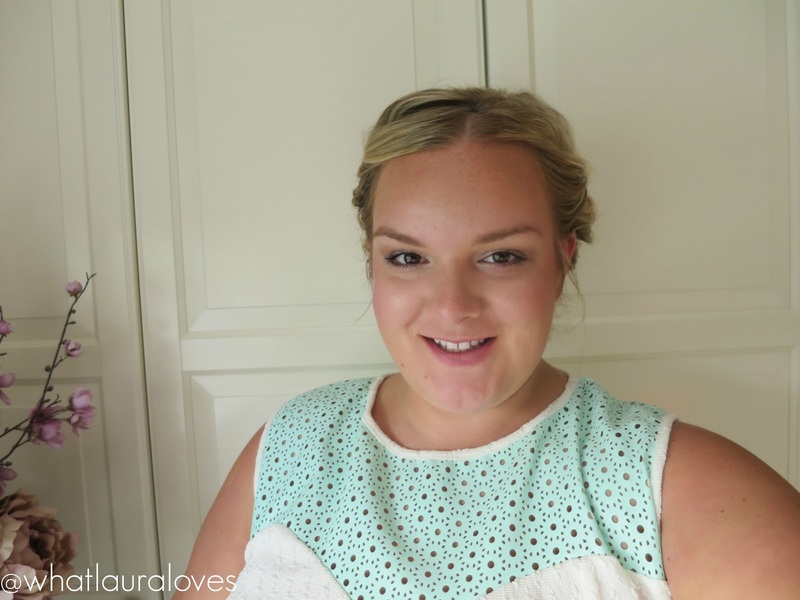 I really like this and think that it is the ideal contour for the summer months because it makes you look more tanned while sculpting the face. I apply it around the perimeter of my face, on my forehead up towards my hair line, under my cheekbones and jawline, down the sides of my nose and a little under my bottom lip. The champagne highlighter shade is great for applying down the centre of the nose, on the cupids bow, brow bone and a little on the centre of the chin. I have been using this highlighter on my cheek bones when I am using a matte blusher but when I am using the blush from this product, I don’t feel the need to use a highlight as it has its own shimmer in it. The blush is a gorgeous light coral colour that is absolutely ideal for summer. It is a very easy to wear shade that I think would flatter a multitude of skin tones and it has this gorgeous golden shimmer running through it that reflects the light so beautifully. I like to wear it high up on my cheeks to really lift and illuminate my face. Alternatively, the three shades can be swirled together to create a really illuminating colour that is great on the cheeks. In the photo below, I used the contour and highlight shades on the areas that I described above and then swirled my brush around in all of the shades to use on my cheeks as a blush, then I touched up with a little bit more of the blush for some extra colour. The effect is radiant, natural and so pretty. Perfect for summer! 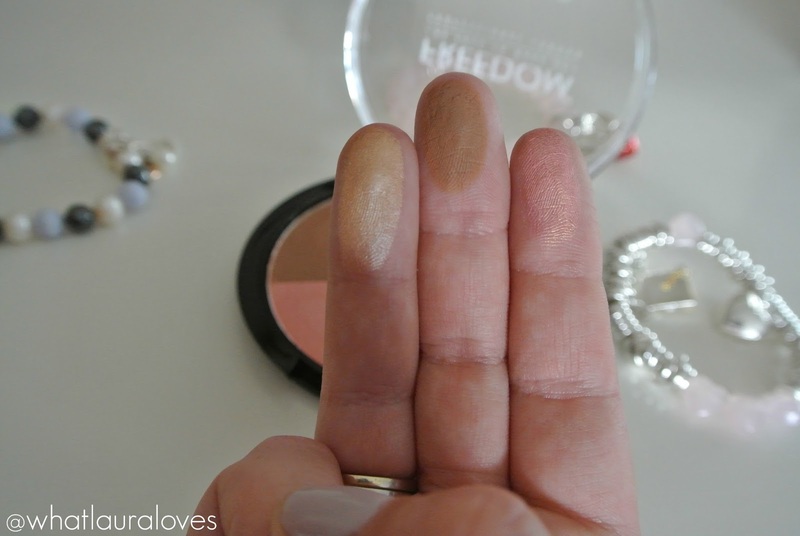 Aside from the shades, what I really love about the Freedom Makeup London Bronzed Professional powder is that the pan with the product in is HUGE! It literally fills my hand as you can see from my Twitter photo. This makes it so easy to use as I can easily swirl a fluffy powder, highlight or blush brush in each colour without worrying that its going to pick up one of the other colours. The packaging is a little bulky for that reason but I would much rather benefit from being able to use the product correctly with my brushes than change the packaging to make it smaller. 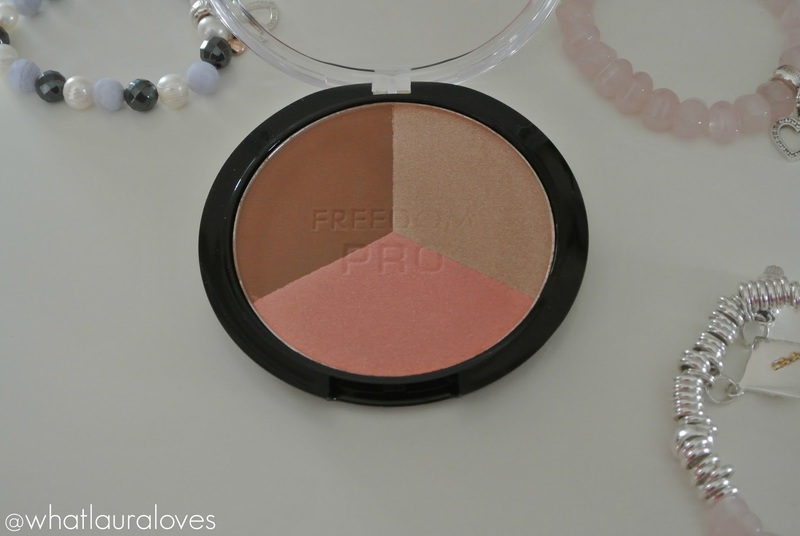 I also love that they have imprinted the Freedom Pro logo into the pressed powder; its a nice touch and a detail that you usually only get with more expensive makeup products. I’m absolutely loving the Bronzed Professional right now as I’m sure you can tell, especially as the shades are so pigmented and the product is incredible value for money. I’ll be posting reviews of the other goodies that I have from Freedom in the coming days so keep your eyes posted for that. 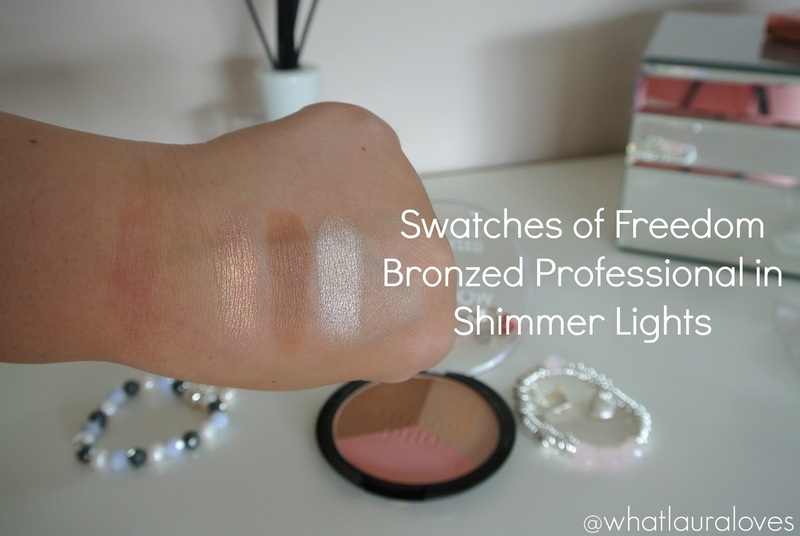 Shop Freedom here and the Bronzed Professional here for an incredibly purse friendly £3. P.S. The new Pretty Little Liars episode is out on Netflix today which makes me very happy. I was gutted it wasn’t on last week! I need to pick this up for my holiday makeup bag!